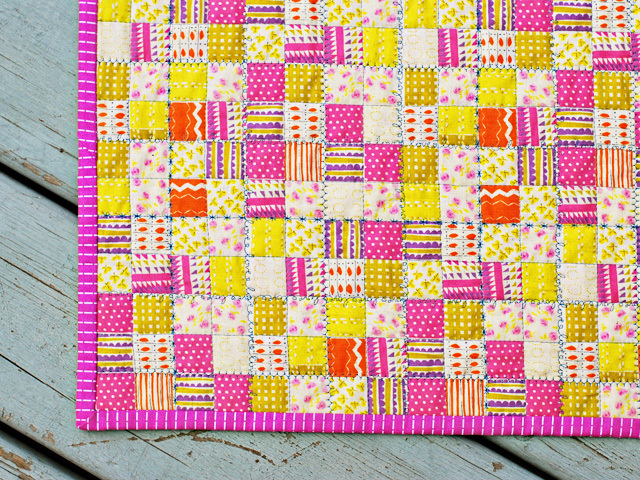 Bijou Lovely: nursery versery quilt. I showed a little peek of this quilt last week and more in my binding tutorial, but now I can share the whole thing with you since I finished it today. I totally cheated with piecing this quilt! 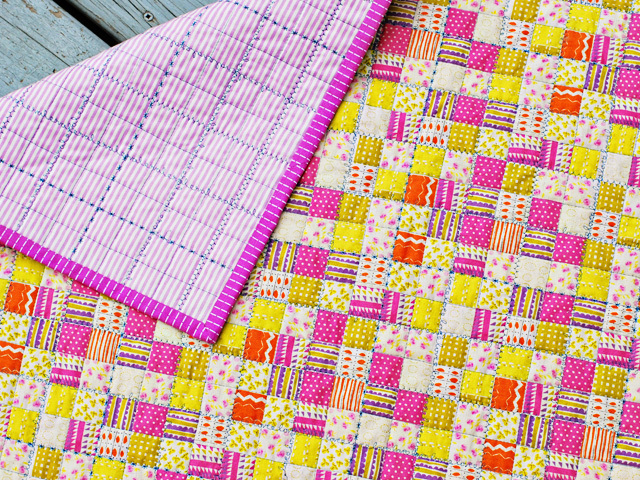 It's just a wholecloth quilt using the Penny Patch print in purple from Heather Ross' Nursery Versery line. The pattern and colors are so cute and I've been wanting to try a wholecloth quilt anyway, so it was perfect for this project. To make it look more like a real quilt, I decided to quilt around each square in straight lines. After doing a few rows I decided it would be fun to try out some of the fancier stitches on my machine! I used stitch numbers 103, 121, and 246 along with the straight stitch on my Janome Horizon. I backed the quilt in a Lecien stripe, which offers some awesome contrast to the front! 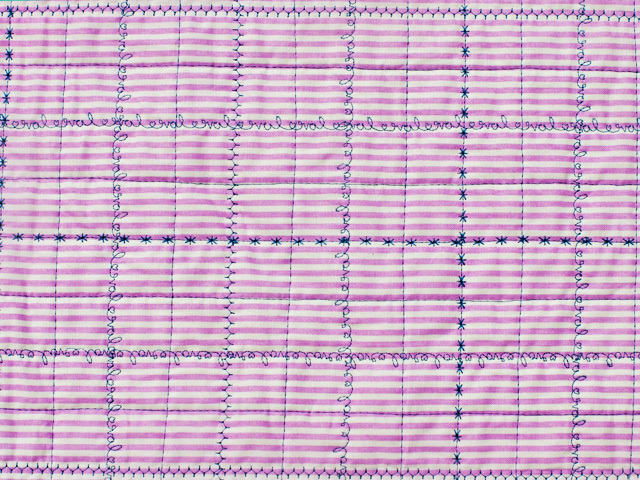 It's bound in one of my favorite prints to use for binding, Lush Running Stitch in Purple. The stitching is much more pronounced on the back, and I don't even mind that the "love" stitch is backwards. The quilt is a small baby size, about 35 x 42". It will be sent off to a new little baby girl very soon! I'm entering this quilt into Rachel's Nursery Versery contest! I would love to work with this line again! So bright and cheerful! This quilt makes me happy. I was just playing around with that same stitch!! 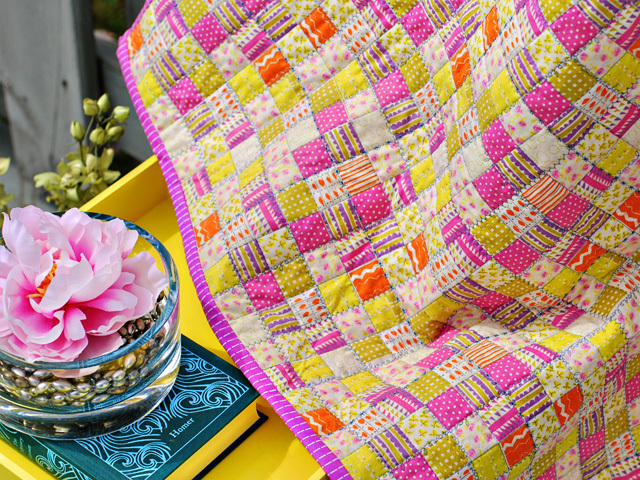 This quilt is so adorable and smart -- I love it Holly!! Fun stitching! What a great way to get to play with those programmed stitches you don't always get to use. Great job! Hm. Now whole cloth quilts are on my to-do list :) and the use of those stitches was just a brilliant idea! Your quilting is just divine! I love what you did with this!! i love the stitches that you used! and i love that it's whole cloth, but looks patchwork. brilliant! Beautiful! I love the binding especially. I'm so glad you were able to finish this in time. What a way to use that particular print. And I love that first picture. Gorgeous! Oh, yay! It is gorgeous. The binding and backing choices are just perfect. And your stitching! Lovely, Holly. I know it will be hard to let this one go. Oooh I'm envious of all those stitches! That's a great fabric choice for a wholecloth quilt, love how it turned out! Love the stitching and the binding is so perfect! I love how you used the stitches! Can our guild put a picture in a whole cloth quilt post we're planning? So pretty! Lucky baby girl! And I really like the fancy stitches on your machine. 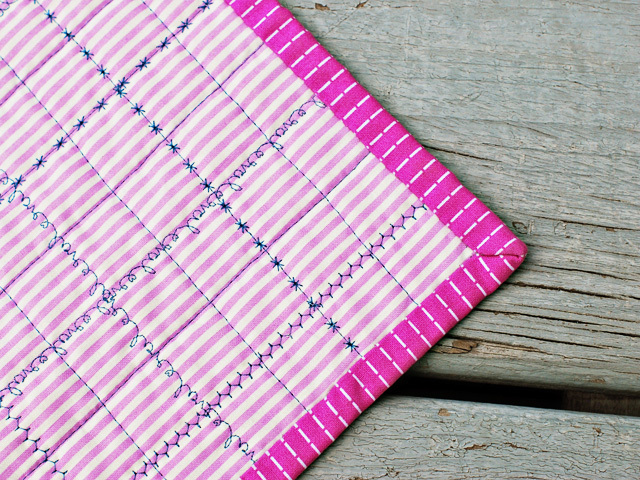 Very pretty and such a simple quilt! You've got to be happy with that! Wow, that looks so awesome. I just love the decorative stitching and the thread color. Good luck! 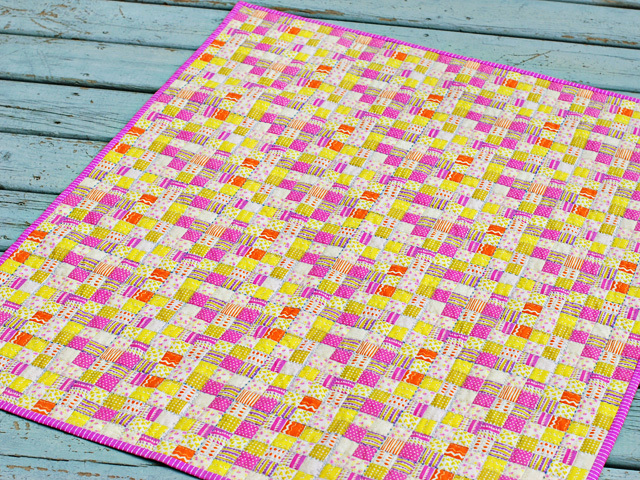 Definitely a great pick for a whole cloth quilt! It's beautiful! I love the "love" stitch. Yay!!! Congrats on making it to the finals! It is realy beautiful. I always wanted to make a wholecloth quilt. This is a wonderful idea. I love it! sorry I missed the chance to vote :( but it's beautiful! 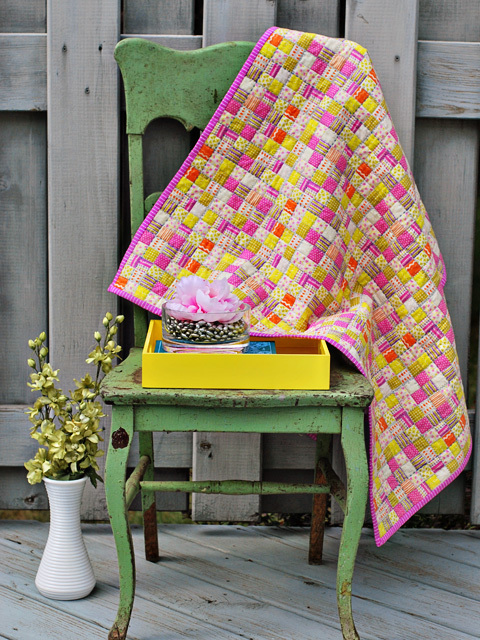 Such a pretty quilt -- and can I say I "love" that love stitch! Very cool. I am sure this little blankie is gonna get lots of love at it's new home. Great job!